looking for a unique holiday kitchen gift idea? love a pots and pans set? discover the perfect kitchen gift for home cooks an chefs during the holiday season! our finely crafted 'pots and pans' tree ornaments are simply irresistible. a handsome addition to any christmas trees, soup pot, frying pan, stock pot and sauce pan comprise our delicious kitchen menagerie. they may look like metal but they are actually crafted from glass! 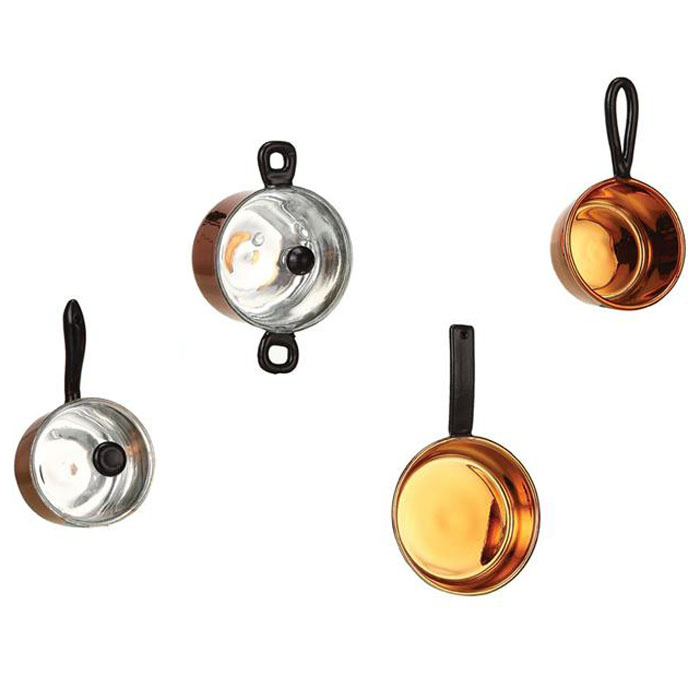 realistically detailed, the pots and pans feature copper plated glass accents that look stunning - their beautiful color is bright against winter greens and displays lovely on any christmas tree. these heirloom quality glass tree ornaments are sure to be enjoyed for many years to come. price is for the complete set of four pieces: one of each style. a great gift for anyone that loves to cook and spend time in the kitchen!